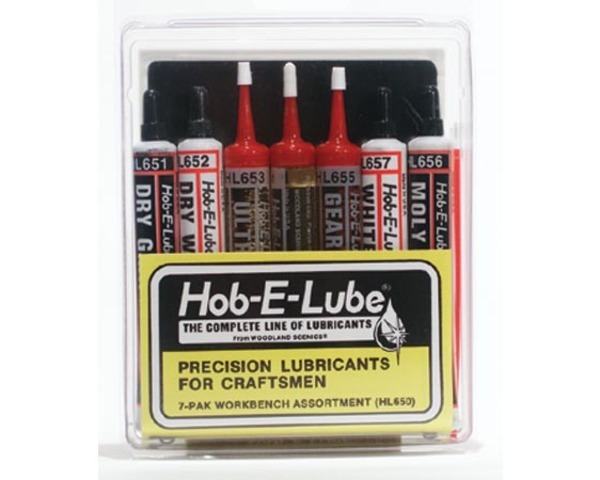 This is a Complete Line of Hob-E-Lube Lubricants from Woodland Scenics. It's a 7-Pak Workbench Assortment of Precision Craft Lubricants for CrafTSMen. lubricants precision designed for tough, close-tolerance model requirements. instructions spelling out precise applications and the exact lubricant to use. Hobby and household uses are almost limitless. wood, metal, plastic, and rubber. when used as a coating prior to storage.